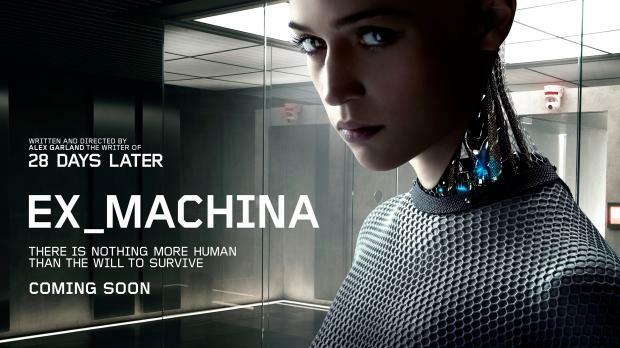 Ex Machina marks the directorial debut of Alex Garland who wrote amongst others Dredd, 28 Days Later and Sunshine. It is a solid and confident effort that impresses less with big sequences but more with elegantly articulated big ideas and uneasy answers. It is old school science fiction released for a new age. The premise is Caleb Smith (Domhnall Gleeson) a programmer at a tech company has won a competition to go and meet with the CEO of the company at his secluded retreat to hang out for a week. There is suitable build up to this with the retreat being remote and isolated and Gleeson having to make the last part of his journey by foot. The CEO Nathan Bateman as played by Oscar Isaac is introduced working out before grabbing a beer and speaking like a friendly college frat boy while still pulling power dynamics wherever he can. Nathan informs Caleb he has nominated him to interact with an artificial intelligence android that Bateman has built to see whether it has become a fully sentient being. He is to interview the android named Ava portrayed by Alicia Vikander daily while she remains in it’s room at all times over the course of the week and report back to Bateman each night to see what they think. The only other character present is Kyoko (Sonoya Mizuno) who is Nathan’s housemaid. How each audience member reacts to each character may say as much about themselves as it does about the characters and certainly one of the pleasures of the film is seeing these very different creatures bounce off each other. The movie enjoys playing with the ideas of who is being tested, is anybody else maybe a robot, who is sympathetic or being dishonest and just where this all may lead? I wouldn’t dare spoil it, it is nice to not be sure of a film’s outcome and yet also at the end be satisfied with it. To create this balancing act you need good performances and Ex Machina has some of the most exciting young actors working today. Domhnall Gleeson as the lead and audience surrogate should conventionally have the least to hide but he gives many layers to his character. Oscar Isaac plays the alpha male here with coiled aggression and relaxed dominance but as the film goes on we see more and more this may be a mask. Alicia Vikander, with this the first of three films for her break out year of 2015 is great, is unnervingly disquieting at times and at others naïve and vulnerable. Sonoya Mizuno given the least to do is mostly a mute performance having to convey character through physicality which she does effortlessly (I’m not surprised to discover she is a Royal Ballet School graduate), one of those performances that can be underappreciated but with which the whole film would’ve suffered if she hadn’t delivered. Set in and around the retreat for the most part with a small cast the film makes a mark with the minimalist architecture of the location clashing strongly with the imposing natural landscape. The understated and cold nature of the text is echoed in this design and also in the score by Ben Salisbury and Geoff Barrow. The design of Ava is quite compelling incorporating transparent machine parts replicating human organs, coupled with body parts often sexualised coated in rubber and then topped off with the doe eyes of Vikander. This is a design meant to confront your own ideas about gender, sexuality and what it is to be human or machine. All the effects were created in post-production with scenes being shot twice (once with Vikander and once without) to capture the background as well. For the machine parts Vikander’s body was rotoscopped out but to retain her movement camera tracking systems taken of Vikander were transferred in. Close to half of the effect shots are in service to Ava’s presence, think about that for a second, half of the effect shots for the film are in service to a character. Apparently Garland worked hard to keep the script low key so that the budget would remain small and he could retain creative control without having to throw in a third act action sequence. That is not to say the third act isn’t exciting, the whole film is a build up to it and it’s gripping as these characters finally reveal what they’re truly capable of while coming to a head. They should make more movies like this. It didn’t appear I’d been following you! What is wrong with my computer? Lloyd, I loved this film a lot. The sound rising to a deafening pitch. I felt she initially liked him and I bought that she genuinely cared for him. Then you realize it was all manipulative way so she could escape. Did I miss something with the near end as she walks to the helicopter and flies away? Wouldn’t the helicopter driver have been wondering where Caleb was or Nathan since he was scheduled to pick up Caleb? Spoiler alert Cindy! After I was uncharacteristically vague 🙂 Yeah a couple of odd things happening. Content for Your Blog commented my post and it hasn’t shown up on my site. But you’re here now and I’m happy to get your feedback. I thought she liked him which made me respect the choices made with the ending even more. Why would ‘It’ care? I hold out hope Caleb is discovered because the chopper pilot or the authorities follow up before he starves to death? But it’s gonna be tight. Odds are they find his body months later. 😦 By the way Domhnall Gleeson is having a stellar run of movies these past few years. He’s like John Cazale in the 70s. I must confess, I don’t care for him! I thought he the weak link in The Revenant–I know he was supposed to be a weak leader, but I thought he was too weak. Anyway, he just doesn’t impress me. However, his father, impresses me greatly! Fair enough Cindy. True story I first blogged 2 years ago about my love for his film About Time. Haha. Brendan Gleeson is a great actor, have you seen The Guard? Yes! I loved Brendan in everything (which is weird that I dislike everything his son does!) however, I thought he was stellar in “Calvary”.